Please note: This content may be out of date and is currently under review. 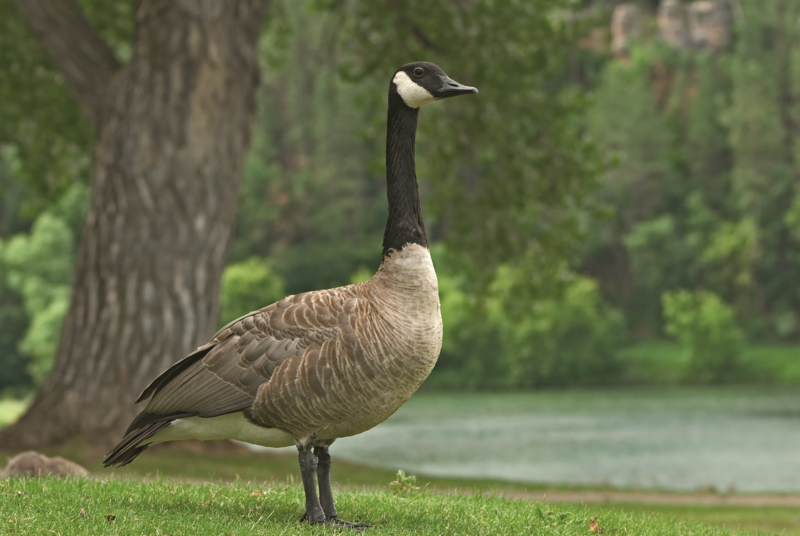 This animal pest alert provides information on the identification, biology, and pest potential of the Canada goose in Australia. The Canada goose (Branta canadensis) is not indigenous to Australia but it is kept here as an exotic waterfowl species and has recently been found in the wild in two states. It is an invasive species which has established populations in many countries including New Zealand. It poses an extreme threat to Australia with significant potential to establish wild populations here and become a pest, so it is important to immediately report any in the wild. The form of Canada goose found in Australia and New Zealand is a moderate to large bird 55-100cm in length (body and tail), with a wingspan of 122-183cm, and weighing 3-6kg. It is brown and white with a conspicuous white patch on the cheeks and chin and a long black neck and head. The bill, tail, legs and feet are also black. Male, female and immature birds are similar although immature plumage is more greyish and the white face-patches are often tinted brown. The Canada goose swims with its neck held upright. It flies (in groups in striking V formation) with neck outstretched and often with loud honking. It is easily identified from below by its black neck, white face-patch, pale belly and dark underwings. It also has a white V-shaped mark on the rump, visible from above and when the bird is taking off. Domestic Goose (all states and territories). A shortened version of the URL, helpful when communicating the URL over email or verbally.